I started this collage with a full page ad from a magazine. 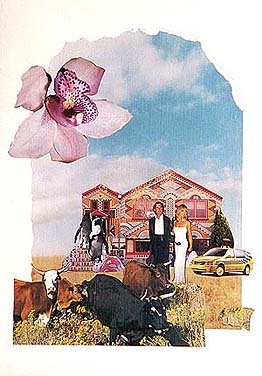 I cut out bits and pieces of fun items from magazines and gradually built up the idea of formal, elegant people living in a funky little house on the prairie with cows in the front yard. This still makes me grin. All pieces were adhered using Golden Soft Gel, which doesn't wrinkle magazine papers as much as fluid medium. The gel is applied generously to the back and the piece is flattened onto illustration board using a soft rubber brayer. The finished collage was sealed with matte medium. Read this article for more information on Magazine Collage.